Home workouts are a great way to exercise without the hassle of cost, travel or opening hours & they can be equally as effective as a gym workout. Procrastination is so common when it comes to exercise & health: it’s too hot/wet, party season, diet starts tomorrow, the gym’s shut, I work late. The truth is, the most important thing you can do for yourself is look after your body & your health & you don’t need a gym or copious amounts of equipment to be able to succeed. Plank – My all time number one, favourite move. Planking is an excellent way to improve your core strength, with available options for beginners to prevent injury. It builds strength also in your upper & lower body, so truly is a great full body workout. There are also ways to advance the plank as you develop your strength: 1 leg, 1 arm, add a press up, etc. Squats – A great calorie burner as you’re targeting large muscle groups. Squats are also an excellent way to increase lower body strength & again, work the core. 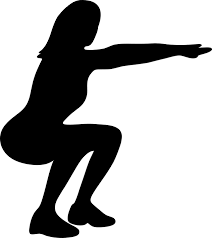 Squats help to strengthen your entire body, including bones, muscles & joints, aswell as increasing flexibility. This results in reduced chance of injury, aswell as making you look good! Half Bridge – An excellent posture to practice after doing planks; a half bridge can improve posture & prevent/improve back pain. It’s also a great move for working the glutes & hamstrings, strengthening the core & energising the body. Reverse Plank – As a plank freak, I also love the reverse plank (yes, & side too!). It strengthens your glutes, hamstrings, abs, lower back, shoulders, triceps & of course your core – what’s not to like?! Again, there are options for beginners (bent legs, on forearms) & developments for when you are more advanced, so it is great for a whole range of abilities.